Birthday is one of the special days of life that energizes a birthday girl or a boy. There is very thin line of celebration that defines birthday celebration at home or in office. There are certain boundaries that you need to maintain and not cross for celebrating your office colleagues’ birthday party. Wish Your Colleague During Happy Hours. Design a beautiful birthday card or buy a nice card with some quotes. Get it signed by all of your team mates or people at office who mean a lot to the birthday girl or boy. Then go back to the desk of your colleague carrying a nice balloon, a card, and a tasty cake. This birthday celebration should be organized during happy hours or when the office hours are over else such a kind of celebration at office may not be liked by the senior officials of the company. Decorate Your Colleague’s Desk With Balloons. You can give surprise to your colleagues on his or her birthday by decorating his or her desk with balloons, some nice cloth, sweets and a tasty cake. This decoration is a part of expressing your love that your college would remember throughput the day. Send Birthday Gift At Home. Well, sending birthday gift at home is one of the common ideas that most of us use to make our colleague feel special. But what about an idea of sending gift, with bunch of colorful balloons to make his or her day more special. Here you can inflate balloons with the alphabets of the name of your colleague engraved over it. This would be one of the amazing ideas to show your love and care. Surprise Your Colleague With Gifts. Try to know a little about your colleague and give him or her things or we can say gifts that he needs the most.This may not be a unique idea but you can definitely surprise your colleague by helping him or her by giving gift items of his or her needs. Don’t forget to inflate the balloons and hand balloons over the gift. You can also use helium-gas filled balloons and allow gift to reach to your colleagues’ desk automatically. Plan Birthday Celebration In Canteen. 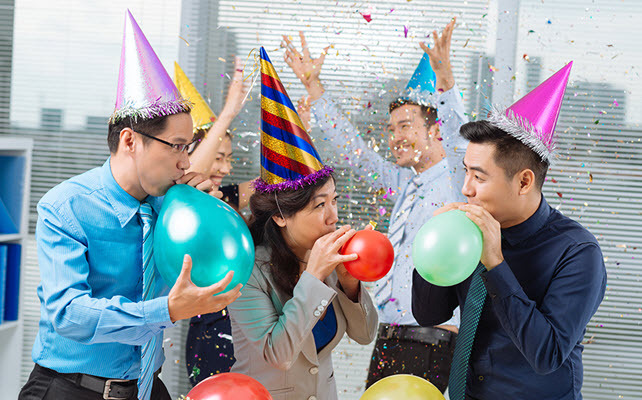 Ask canteen managers to decorate the party area with balloons. You can call your colleague and your team mates in the canteen and decorate canteen area with beautifully colored balloons. Organize some snacks, if you can’t do this alone, ask your team mates to contribute for the party and let your colleague enjoy on his or her day. Above are the simple yet unique ideas that would definitely make your office colleague’s birthday day more special.